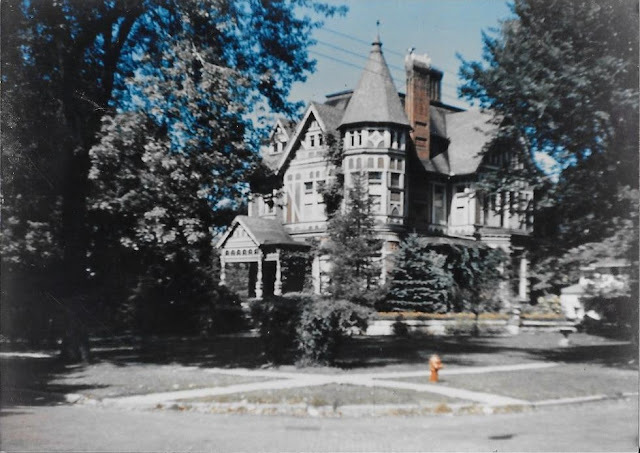 For those of us who didn't have the opportunity to see Jacob Haish's DeKalb mansion at 227 Pine St. before it was razed in 1961, this July 3, 1885 DeKalb Daily Chronicle article, posted in full below, tells intimate details of the interior of the mansion. 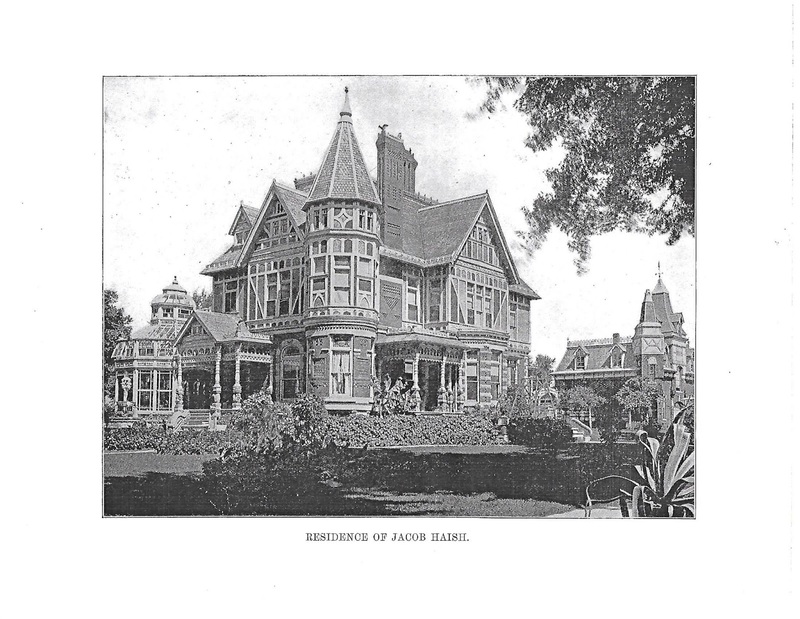 Steve Bigolin shares this article, and he said at the time it was written, Haish had just completed the mansion and invited the media to visit. Bigolin said Haish also closed down his factories and invited his employees to enjoy the home with him that day, to show them "what hard work can do," Bigolin said. "It is a source of pleasure, we may even say delight, to watch the growth and progress of our little city, and we rejoice to know that there are those in our midst whose enterprise, pluck, push and perseverance have placed them beyond the bread and butter aspect of life, and they are now in a position to do something for the asthetic and the beautiful. Having built up great Industries, they are now ambitious to add something to the town that marked their prosperity. We are therefore glad to "CHRONICLE" the enterprise of our esteemed fellow-townsman, Jacob Haish, Esq., who has just completed one of the most unique and attractive residences it has ever been our pleasure to inspect. The design is Mr. Haish's own, and is an original and attractive combination of Medieval, Gothic and Queen Ann style of architecture. And as no man owns a patent on ideas or terms of speech, we would therefore utilize Mr. Haish's own idea, and designate this exquisite and notable structure as the new "Sophiann" style, which we expect will be all the rage in the very near future. The materials used in the construction of this building are peculiarly adapted to the ever changing temperature of these latitudes. The first story is built of brick, terra cotta, and finished with white stone. The second story is what is known as the Queen Anne composition, and the whole structure is set off with a handsome Gothic roof. The entire building is warmed by steam, and the ventilation is on the most approved modern scientific principles, and may be said to be perfect in every particular. It is lighted by gas in every room, from cellar to garret. Three kinds of water, well, artisan, and soft, can be had in abundance at any moment, hot or cold, night or day, and bathing facilities and other conveniences are excellent. There is a fireplace in every room, and the cheerful blaze of sea coal will make the whole house cozy and home-like in the dark, dreary winter months. The mantle-pieces are are of Scotch granite, Tennessee, and other kinds of marble, and are sculptured into the most pleasing and fascinating designs. Hammered brass and crystal chandeliers of modern design and exquisite workmanship, hang in every room, and when lit in the evening they sparkle and scintillate like resplendent gems in Aladdan's palace of Enchantment. The main hall is a thing of beauty. The floor is tiled with blue and white marble, and the walls are covered with landscapes, portraits, marine and mountain scenes, all done in oils, producing a very fine effect, and reminding one of the old castles and art galleries of Europe. The main stair is of carved wood and black walnut, and is a fine exhibition of the wood worker's skill. On the second floor, at the head of the main stairway, there is another large hall decorated like the one below, and furnished with a piano, antique chairs and lounges. The drawing room walls are covered with satin and gold decorations, and a most exquisite floral wreath done in oils, together with butterflies, bees, humming birds, and a harmonious blending of colors; gold-leaf and diamond dust adorn the ceilings. The transom windows are of stained glass, wrought into beautiful landscapes, river and moonlight scenes. A rich carpet of Scotch manufacture covers the floor, and brilliant French mirrors and handsome furniture make the entire room like one of those fairy palaces we read about in the "Arabian Nights." The dining room is a marvel of artistic beauty and perfection. The floor is set with brown and white tile, with a handsome border. The wood work is butternut, richly carved and finished in oil. The lower part of the wall is magnificently grained with fruits and flowers. On the north wall is an ornamental sideboard, with a resplendent French mirror. The transom windows are all made of colored glass, and the designs are exquisite, being a blending of every kind of fruit and vegetable. In line with these windows is a splendid cluster of oil paintings encircling the room, consisting of farm scenes, winter sketches, hunting and fishing studies, beautiful bits of prairie, woodland and river sketches, child-life and their innocent frolic. All this diversified blending make up a panorama of lovliness that feast the eyes, and is exceedingly suggestive and appropriate for a Dining Room. The Red Room to the west of the drawing room is very unique. The wood work is composed entirely of California red wood, very richly carved, and its fine grain when finished in oil makes it very attractive to the vision. The walls are covered with red satin and gold decorations. The ceiling is regarded by all who have seen it as the most perfect work of its kind they ever looked upon. It is a wreath of Autumn leaves, a number of birds have gathered for their last meeting, and they migrated to fairer lands from the rigors of approaching winter. The birds appear sorry to go, and there is a pensive look, full of pathos and feeling, as they turn their heads towards their own nests with its broken shells, from which many of them were hatched a few months since. This in our judgment is one of the finest things in this palace of beauty. The transom windows in this room are superb, we have never seen anything equal to it for richness of coloring and artistic design outside the old world art galleries and cathedrals. The upholstery of this room is all that could be desired. The parlor on the second floor is by far the handsomest room in the house. There is a dome in the ceiling on which is painted the four seasons. Spring is represented as a splendid landscape, with men ploughing in the distance. In the background there is a village with a passing train, and in the foreground there is a pretty little farm house, with a number of playful children and skipping lambs. It is a picture full of life and movement. SUMMER. In a haying scene. The day is perfect, a fleecy cloud in a deep blue sunny sky seems all a quiver with warmth and brightness. The jolly haymakers striped for their toil and sweating at their work seems so natural, that we almost fancy we drink in the fragrence of the new mown hay, and catch the toilers merry laugh. AUTUMN. Represents a corn field in the distance, with the corn stalks just cut and put up in shocks, and between the rows of shocked corn there are large numbers of bright yellow pumpkins. In the foreground there is a gentleman's residence and a large orchard with trees hanging thick with ripe fruit. A buggie drawn by a handsome team of horses comes dashing down the road, and a dog just ahead is in full pursuit of a rabbit, it is a well conceived and finely executed picture. WINTER. Represents a logging camp in the midst of a forest of large trees, the loggers fire is seen in the background, and though the deep snow, a hunting party is drawing game on a hand sled, and in the foreground there is a number of horses and men logging out some large trees, this too is a very natural and well executed piece of work. Just out side of the dome there is a beautiful border done in oil, and set off with some magnificent artistic work in Mother of Pearl. The wall decorations are exquisite, and the bric-a-brac carpeting and furniture tend to make it a marvel of richness and elegance. The blue room, Mrs. Haish's room and Mr. Paul Holm's are exquisitely beautiful. It would ill become us to depict the rich and rare attractions, in these "Sanctum Sanctorums." It is sufficient to say that all that wealth, good taste and human skills could do, to fit up, and beautify and earthly paradise are gathered here. The rooms set apart for the use of the help, are good enough for any man or woman, be they prince or princess. All the sleeping rooms have speaking tubes communicating with the rooms below, so that anything that may be needed can be had without leaving the room to call for it. The kitchen is a gem of comfort and convenience. The pantry is done off in black walnut, with ornamented glass doors, drawers and and every other needful thing. The china closet is a model of taste and elegance. In the third story there is every essential for laundry work. There is a door from the stairway of the main hall into the conservatory, which will soon be filled with choice plants and flowers. Well may we call it "Palace Beautiful" for it is built regardless of expenses, and in its composition it is "Cosmopolitan" or at least "Continental" for there is something in its construction or ornamentation from every State in the Union. And the entire work of building and decorating was executed under Mr. Haish's own personal direction and supervision. And that he and his good wife may live long to enjoy this beautiful home, is the fond wish of a host of friends who rejoice in his prosperity, and are proud of his success."